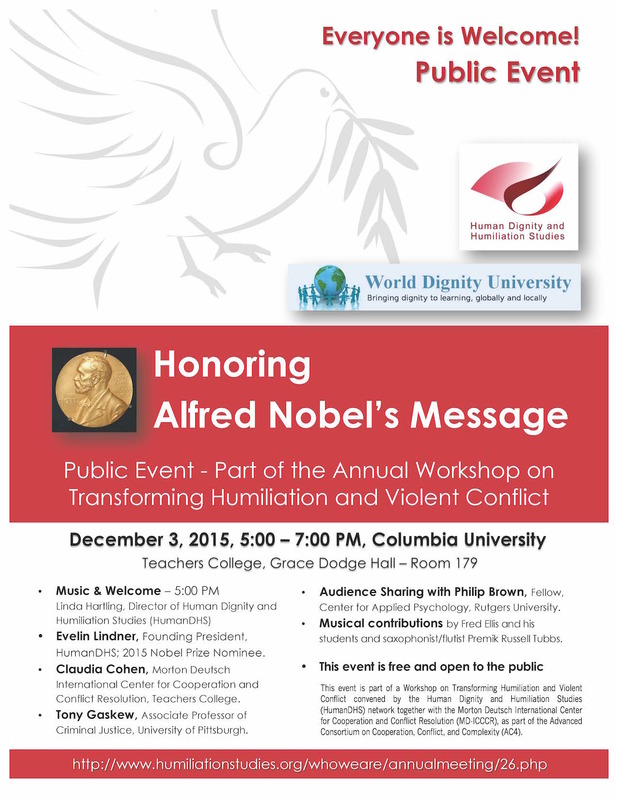 This is our very warm welcome to -- and reminder of -- our upcoming Workshop on Transforming Humiliation and Violent Conflict : Thursday and Friday, December 8 - 9, 2016, Columbia University, Teachers College, Room 150, Horace Mann Building (525 West 120th Street, subway 1, exit 116th Street). 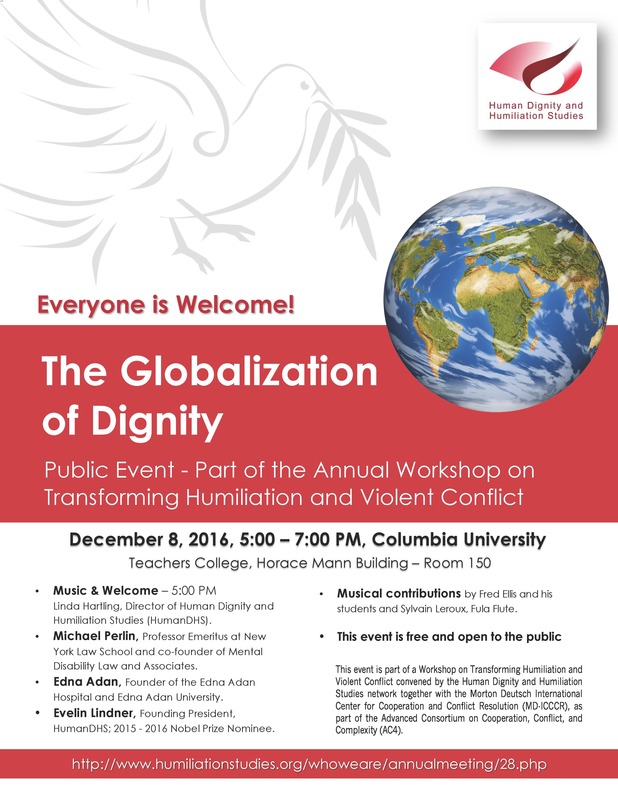 The Globalization of Dignity is the theme of this year's workshop. The extreme polarization and brutal contentiousness we've seen in U.S. politics this year serve to redouble our commitment to "walk the talk" of dignity in all aspects of our efforts. Thank you for joining us on this path! We invite you to download our workshop program in advance to help you with your plans. Registration begins at 9:00 AM; the workshop begins at 10:00 AM. We would also be grateful if you would kindly complete your Appreciative Introduction form and bring it with you. Whether you join us as a creative contributor, a supporter, an active listener, a moderator, a dialogue facilitator, or in some other collaborative capacity, we want to emphasize that everyone in the workshop plays an important role in creating a climate of connection and mutual learning on the path to dignity! Our conferences and workshops are designed to widen space for collaboration, conversation, and mutually energizing connection. Because we have such a richly diverse community of contributors, we have learned that there will never be enough time to say all that needs to be said nor enough time to do all that needs to be done. Consequently, we strive to move beyond the conventional lecture/presentation format to meet in a spirit of sharing in humility and equal dignity. In addition to our preplanned Dignilogue (Dignity + Dialogue) Sessions, our afternoons will be highly action oriented and organized around Co-Created Dignilogue Groups. These groups will focus on topics of interest proposed by YOU. Rather than planning a "presentation," we encourage you to come as you are and enjoy the mutual learning experience of engaging in -- or even facilitating -- authentic, creative conversations that lead to new ideas and new opportunities for action. Please join us in thanking Phil Brown for leading us as we organize our Co-Created Dignilogues. 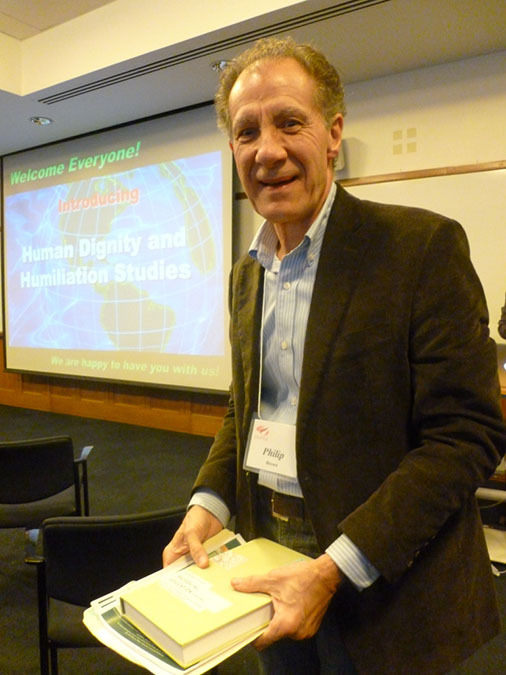 We are delighted to announce that we will be honoring Phil's lifelong commitment to fostering dignity in the world by presenting him with the 2016 HumanDHS Lifetime Achievement Award. The grand finale of each afternoon will be inviting representatives from each Co-Created Dignilogue Group to document the highlights of their conversations and insights in a Dignivideo. These videos will be treasured contributions to our World Dignity University initiative to be shared with the world, inspiring future generations of our community. We look forward to having you with us at our Public Event (Thursday, December 8th, 5:00 - 7:00 PM; Room 150, Horace Mann Building) . We are thrilled to announce that Michael Perlin, Professor Emeritus at New York Law School and co-founder of Mental Disability Law and Associates, will be sharing his reflections on " Dignity and the Nobel Prize: Why Bob Dylan Was the Perfect Choice." 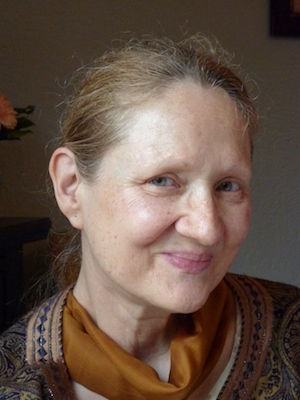 It has been an honor for the HumanDHS community, through Evelin Lindner, to be nominated for another Nobel Prize in 2015 and 2016, namely the Nobel Peace Prize. We are also honored to have with us Edna Adan, the founder of the Edna Adan Hospital and Edna Adan University. She is an activist and pioneer in the struggle for the abolition of female genital mutilation and is President of the Organization for Victims of Torture, Somaliland. 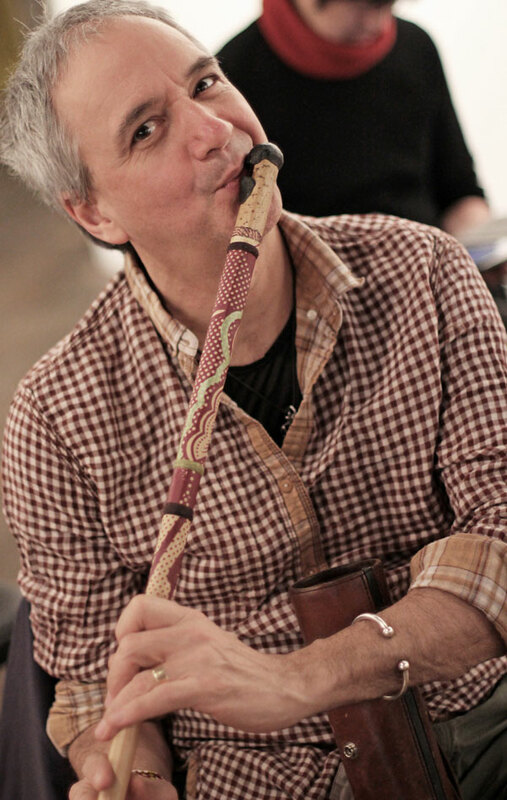 The evening will be energized with songs from Fred Ellis and his wonderful students and with Sylvain Leroux with his Fula Flute music . We warmly welcome you and the general public to this event. Please bring friends and family, and invite your networks, as this event is free to the public! We are deeply thankful to our friends at Teachers College for making it possible for us to meet in Room 150, Horace Mann Building. Since our workshop takes place during an extremely busy time of the year, we are always grateful to have meeting space in such a remarkable institution of learning. Please join us in especially thanking our Honorary Convener Morton Deutsch and all of our colleagues at The Morton Deutsch International Center for Cooperation and Conflict Resolution (MD-ICCCR)! Please join us in recognizing and thanking our "Team of Careholders" and "Dignigardeners" who make this program possible! Careholders oversee crucial components of the workshop, including welcoming and registration; meeting/greeting, videography/photography, music/movement, moderating/facilitating, and time keeping. Their efforts nurture the unique relational climate that encourages rich, empathic, and energized engagement. 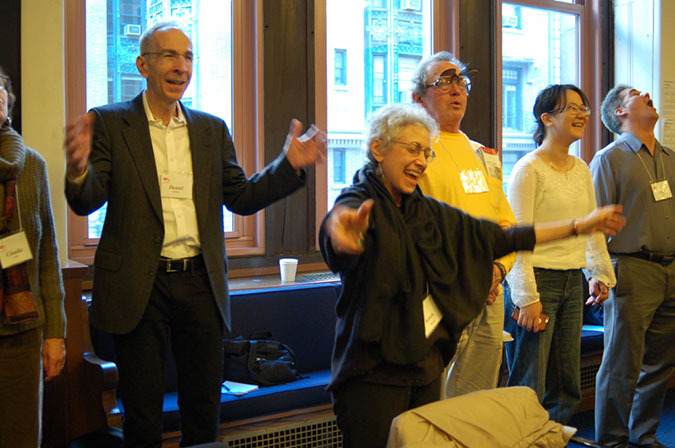 Dignigardners play an important role encouraging, supporting, and recognizing dignifying dialogue throughout the workshop. They can be especially helpful in facilitating the dialogue when differences present opportunities for new understanding and mutual growth. We are delighted to welcome these skillful friends to support everyone in their efforts to create the relational space that generates thoughtful connection and constructive collaboration. We have a wealth of creative talent in our HumanDHS community. This has inspired us to "keep art close to our hearts" during our workshops. In particular, we welcome returning friends to share their creative talents in bringing us together and organizing transitions between workshop activities. Please kindly remember to thank them for their generous contributions! Many of you have already registered for our workshop, and your name is already listed on the webpage. We welcome you most warmly! You may wish to check whether your biographical sketch is on our website, and, if yes, is it up to date? If you have an abstract or a paper you wish to share (or you develop a new paper that emerges from the inspiration that our workshop experience brought to you), you are warmly invited to send it to us so we can publish it on our HumanDHS website. For those of you who would still like to join us and have not yet registered, please kindly send a message to: workshops@humiliationstudies.org. We would be delighted to hear from you by November 28th or sooner. Again, we are very much looking forward to seeing you at the workshop! Joining together to bring dignity into the lives of all people is more important than ever before. P.S. We encourage you to print and retain this reminder to help you with your travel plans. A Special Note: We want to thank all of you for protecting your health prior to and throughout the workshop. Since we meet during flu and cold season, we feel a special responsibility to encourage everyone to be proactive in their efforts to protect their own health as well as protect the health of all who join us for this workshop. Our deepest gratitude for your kind care. Launching Evelin Lindner's New Book! Honor, Humiliation, and Terror, published by Dignity Press. It would be wonderful to have you join us at 12 - 2 pm, Wednesday, December 7th, in Gottesman Libraries of Teachers College, room Russell 306, to celebrate the upcoming release of this important publication!